As the weather temperature is mild during autumn season, it will be exciting to experience fishing in Branson during this season. Autumn is a great time to fish as the fog that had settled over the water is starting to disappear and soon trees on the lakeside will come into view with autumn leaves changing colors from lustrous greens to vibrant red, orange and gold colors. 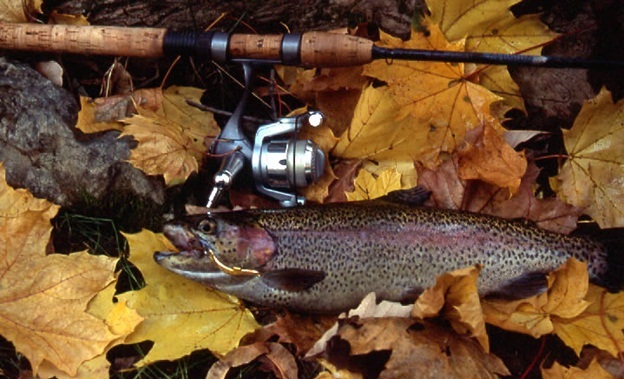 During this time of year, you will see many kinds of fish such as rainbow and brown trout. These big browns are a big draw to fly fishers in the Tri-Lakes area in Branson. The cool waters in autumn revitlalize the fishing on Bull Shoals Lake. The banks on the main lake and in major creeks are great locations to find all three species of black bass. Willow leaf bladed spinnerbaits that are used near cedar trees can produce big Largemouth during autumn season. You can catch Walleye in the same locations as bass at this time of year. Some of the biggest walleye are caught at night during autumn on flat gravel points and flats with suspending jerkbaits. Bass fishing at Table Rock Lake can be exciting during autumn season as bass fish out of their deep water summer haunts and move toward the backs of creeks in search of zoo plankton blooms. Channel swing banks are important fishing area in autumn, as these areas act like holding areas for both shad and bass causing both to “bunch up” making the bass easier to catch. Productive baits that are good to use in the area include Pigsticker football jigs, Spro Rock Crawler crankbaits and War Eagle Spinnerbaits and buzzbaits. The White River in Arkansas is known as a better brown trout fishery, but Lake Taneycomo in the Tri-Lakes area holds some giants of its own. In this lake, you will find the best rainbow trout fishery in the entire White River system. The average size of rainbow trout at Lake Taneycomo is 14 to 16 inches. But there’s always a chance to catch 22-inch trout. A fly tier can create many patterns for Taneycomo and it can make a few tricks to help anglers catch more fish. The most interesting way is to tie a midge imitations on a slightly larger hook. If you can tie a size 20 midge on a size 18 hook, it gives you a better chance of hooking the fish because the larger hook has a bigger gap. If you want to catch more fish, try fishing at Table Rock Lake in the Tri-Lakes area where you can have a better chance of catching bluegill, catfish and, of course, three species of black bass, large mouth, smallmouth and spotted. Known for its clean and crystal clear waters, Table Rock Lake is also popular for boaters, scuba divers, and swimming during summer time. Fishing in Branson can be great and exciting activity for anglers of all levels as the area is abundant with different kinds of fish.